Category: World maps and Celestial. Tag: 20th Century. A large decorative world map showing the significant expansion of the airline network from Paris to Europe, Africa, Americas, Asia and Australia. 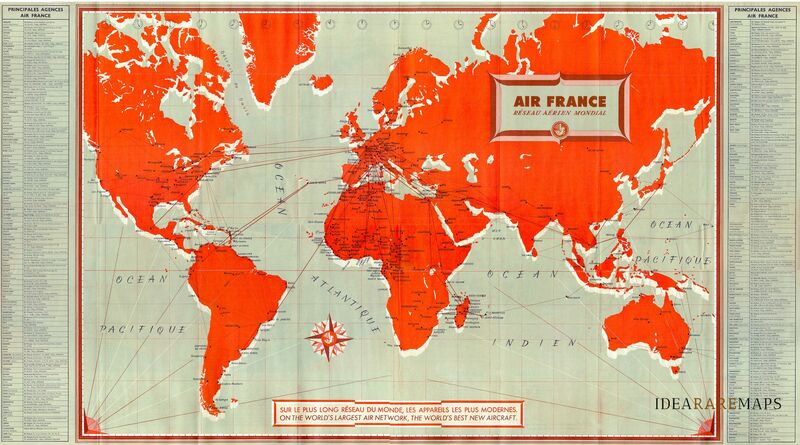 The map was published to advertise also the comfortable aircraft Vickers Viscount a new British medium-range turboprop airliner first flown in 1948, the first such aircraft to enter service in the world. The Viscount was well received by the public for its cabin conditions, which included pressurisation, reductions in vibration and noise, and panoramic windows. It became one of the most successful and profitable of the first post-war transport aircraft. The large map, published by Atelier Perceval as depliant brochure in 1950 is decorated by a compass rose. On the verso pics of the aircraft and description of its comforts and some photos of the most beautiful destinations. 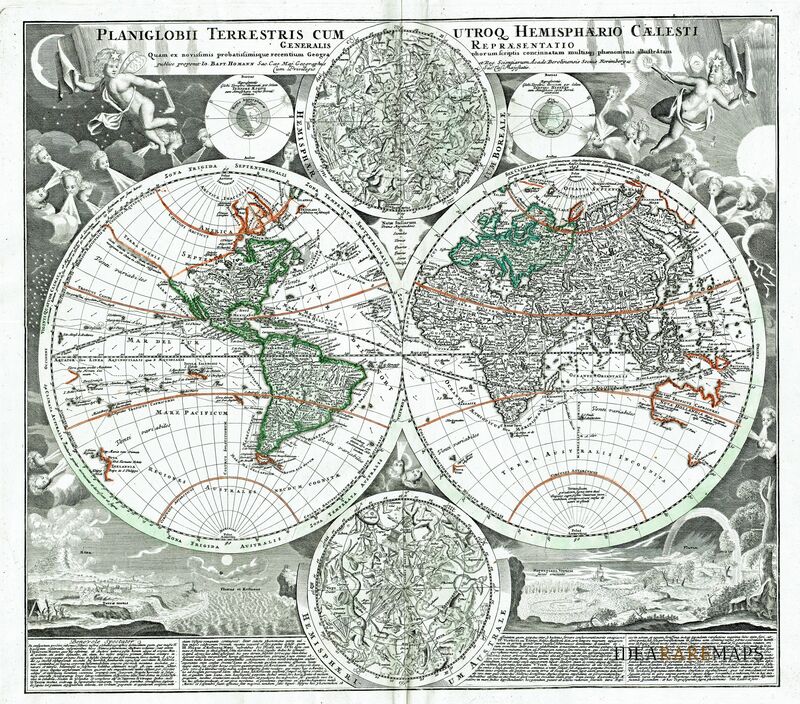 One of the most decorative eighteenth century world maps. This J.B. Homann’s double hemisphere map of the world is richly embellished with celestial models of the northern and southern hemispheres and other natural phenomena such as waterspouts, a rainbow, earthquakes, and the Mt. Etna in Sicily erupting. Wind heads occupy the starry heavens, and two cherubs hold the title banner aloft. 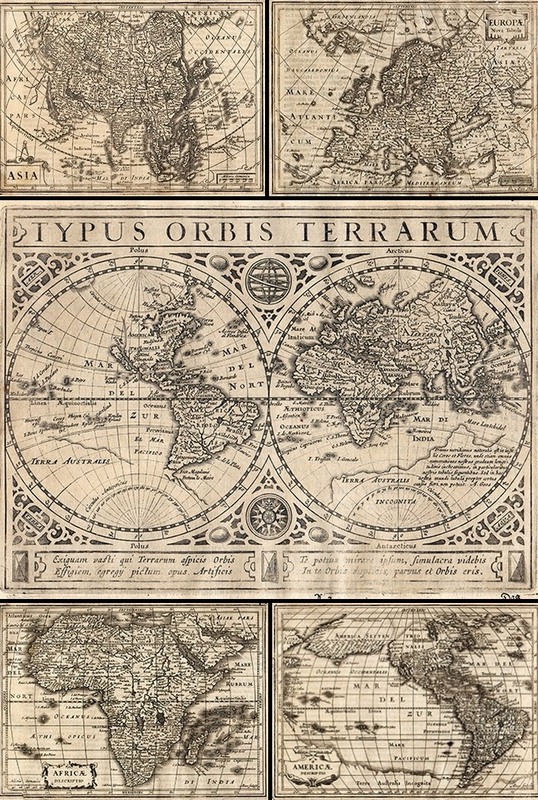 The map includes many famous cartographic inaccuracies with an unusually elongated northwest coastline in North America, labeled Terra Esonis. It also shows an incomplete Australia, although with place names and notes of the early discoverers included. The east coast of New Zealand is shown, along with the Tracts of Tasman’s 1642 voyage and Magellan’s Voyage. The detail in Southeast Asia is very interesting for the period, as is the treatment of Japan. Interesting text panels at bottom describe the natural phenomena. 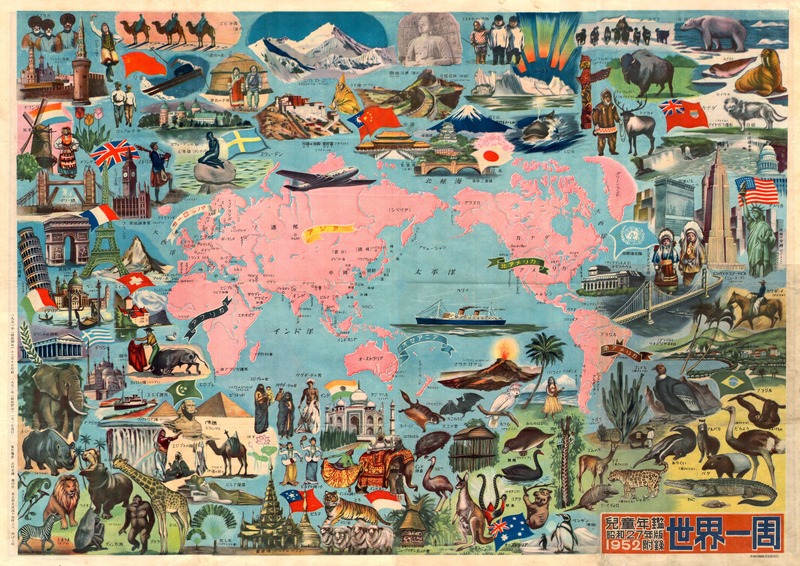 A beautiful very decorative Japanese world map surrounded by nice illustrations featuring scenes of animals, people or important ancient and modern buildings from across the globe. The map shows only essential geographical information like capitals and names of the countries and continents because a second world map more detailed and marking the flight routes between major centres is printed on verso. A really nice uncommon map. 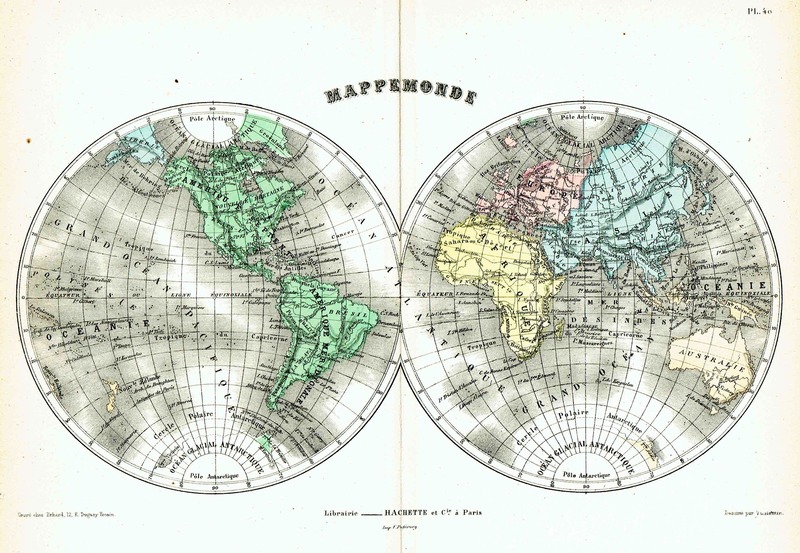 Detailed lovely world map in two emispheres by Eduard Dumas-Vorzet from the famous Atlas Universel d’Histoire et de Geographie by Marie Nicolas Bouillet published in Paris in 1877.